Seven piece mini travel set with carry case. Set includes (left to right in photos) a multi-purpose eye shadow/concealer brush, slanted liner, eye lash and brow spooly, eye shadow brush, smudger, blush brush and foundation buffer. 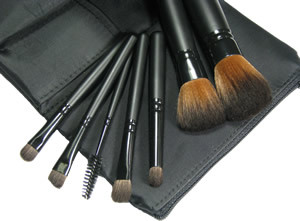 Brushes come in a black nylon traveling case with zippered pouch for your cosmetic extras. Perfect for purse and travel. Travel case with brushes is approximately 5 1/2 inches high by 4 inches wide by 1 inch thick.